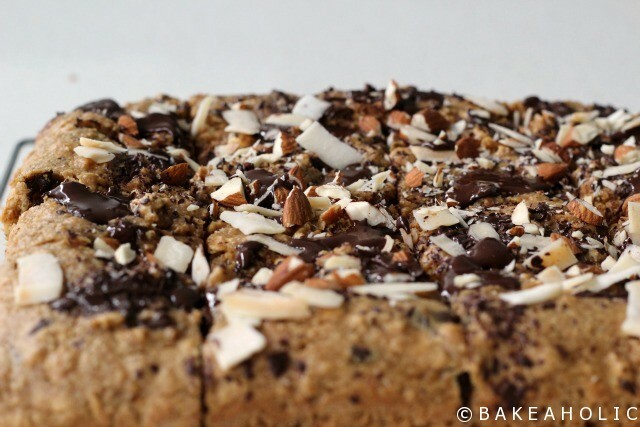 Almond butter chocolate chunk blondies – a mouthful to say, and eat. These bars are chewy, crunchy and stick-to-your-mouth almond butter-y. You could switch the almond butter for peanut butter, but I find that almond butter has a deeper, more nutty flavour to it. And bonus, they’re wheat-free. Instead, make your own oat-flour in the blender. Adam and I recently bought a Vitamix. We put it on our registry, but we understood it would probably not be purchased since it is quite expensive. The Vitamix was definitely high on the ‘want’ list – so we waited until it was on sale and used some gift cards towards it. I use my blender on a very regular basis. Aside from smoothies, I used my blender for soups, purees, pancake and waffle batter, nut butter, ice-cream, sauces etc. So I was so thrilled when we finally got one. It came with two blender jugs, one specifically for dry grinding, such as making your own oat flour from oats. The oat flour comes out so smooth and fine. It’s amazing. I can’t wait to make some more flours for baking. I’ve been trying to get some more recipes developed and made for the site to keep up on a more regular basis. Over the past year with wedding planning i’ll admit I was absent from the blog quite a lot. Now that the weather has been keeping us indoors, and I’ve got more free time on the weekends I’ve been trying to create some more recipes to post. The problem with working is that by the time I get home, the sun is just getting ready to set, and the light is terrible for taking photos. I only use natural light to take pictures for the blog, so beginning to bake at 4:00 and having the finished product ready after 5, means there’s little to no light left. So, on the weekends I’ve been trying to get in at least two recipes to make and photograph for the week ahead. 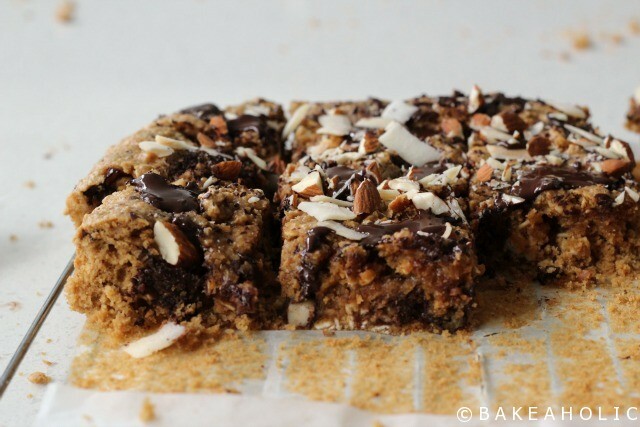 These Almond Butter Chocolate Chunk Blondies were definitely one of them. I made these last week and they were so good. Definitely a welcome little snack each day. 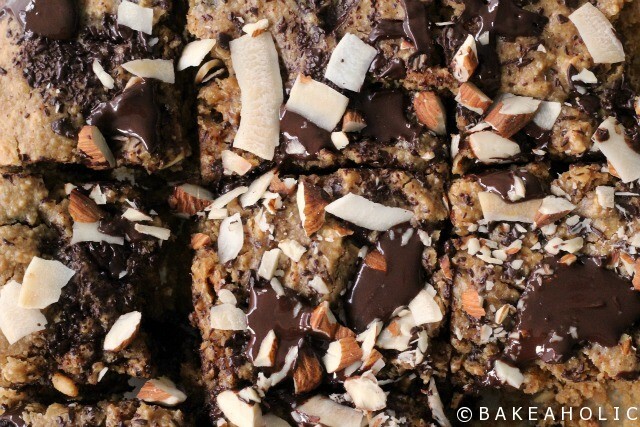 Almond Butter Chocolate Chunk Bars are chewy, crunchy and stick-to-your-mouth almond-buttery. To make the oat flour, blend 2 cups oats on high speed until fine flour, then measure out 1 and 3/4 cups. 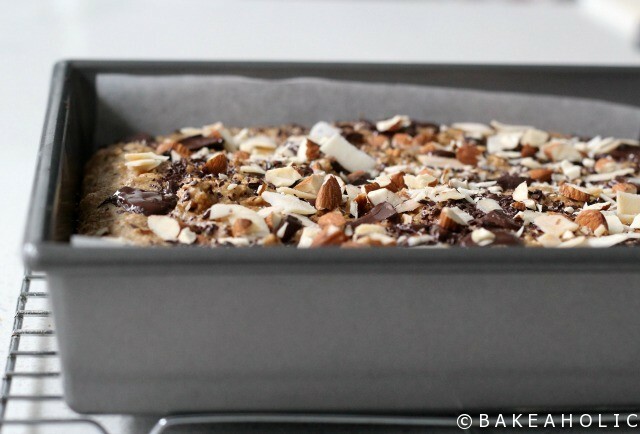 Line an 9x9-inch square pan with parchment paper. In large mixing bowl or stand mixer with whisk attachment, cream together the coconut sugar, almond butter, coconut oil and vanilla. Add in the eggs and mix to combine. In separate bowl, whisk together oat flour, rolled oats and baking powder. With mixer on low, alternate adding dry ingredients and milk. Mix to combine on medium-low speed. Remove bowl from mixer, and add the chocolate chunks using a spatula or spoon to combine. Scoop batter evenly into prepared 9x9 baking pan. Sprinkle top of batter with chopped almonds, coconut and chocolate chunks if desired. Bake for 20-22 minutes, or until edges are golden and toothpick inserted in centre comes out mostly clean. Let cool completely on countertop, remove from baking dish an cut into bars. Store in container or ziplock on countertop, or freeze. They are deliciously dense when frozen - and have a lovely crisp crust on top. When the chocolate sets, it adds a satisfying bite.